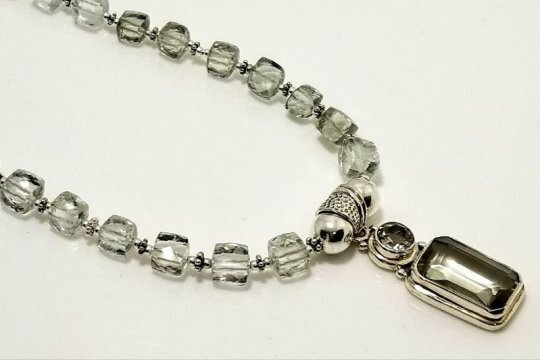 Please note: if you wish to purchase this necklace, since it is a One-of-a-Kind Design, please contact me before purchasing, due to the fact that it may have been sold. Green Amethyst Semi-Precious Gemstones, adorned with .925 Sterling Silver. This necklace is simply elegant and stunning. Amethyst is February's birthstone. This necklace will transition easily from day to evening wear. All Items purchased will be shipped within 1-3 business days, upon receipt of payment. Items are shipped in my signature Brown, Black, Beige and/or White packaging for that added touch of elegance.